The iRB have been stamping down on Tip tackles and Spear Tackles since 2007 and have released 3 memorandums to referees to ensure that they are getting the message. These memorandums are also circulated to all the national unions, so the top players are well aware of it. In 2007, the IRB Council approved a Laws Designated Members Ruling which essentially made it clear that tackles involving a player being lifted off the ground and tipped horizontally and were then either forced or dropped to the ground are illegal and constitute dangerous play. At a subsequent IRB High Performance Referee Seminar at Lensbury referees were advised that for these types of tackles they were to start at red card as a sanction and work backwards. Unfortunately these types of tackles are still being made and the purpose of this memorandum is to emphasize that they must be dealt with severely by referees and all those involved in the off-field disciplinary process. Attached is a recent decision of the Judicial Officer Jannie Lubbe SC, in which the differences between the application of the red card test by referees and judicial personnel is highlighted. In our view, this decision correctly highlights that the lifting of players in the tackle and then either forcing or dropping them to the ground is dangerous and must be dealt with severely. The player is lifted and then forced or “speared” into the ground. A red card should be issued for this type of tackle. The lifted player is dropped to the ground from a height with no regard to the player’s safety. A red card should be issued for this type of tackle. For all other types of dangerous lifting tackles, it may be considered a penalty or yellow card is sufficient. Referees and Citing Commissioners should not make their decisions based on what they consider was the intention of the offending player. Their decision should be based on an objective assessment (as per Law 10.4 (e)) of the circumstances of the tackle. Within this memo I have made bold and red the part which pertains to exactly what Sam Warburton did. He tackled the French player, he took his legs past the horizontal, and then dropped him from height. As you can see, this is a Red Card, and so Alain Rolland was correct. I expect Sam Warburton will also receive a fairly hefty suspension as the iRB are trying to stamp out this dangerous play. this crossed with my thread that makes the same point, but if the IRB want commentators, coaches, club-refs, players, journalists, spectators to understand this policy then they could start by putting in on their website. do you think these "articles" should contain a disclaimer: "this article is the view of the article author and does not necessarily represent the views of the 7 billion other people on planet earth"? Or are you trying to emulate SA ref site? What about all the other tip tackles in the tournament that have not resulted in red cards. Even with my "one-eyed jaundiced view" (before anyone else says it yes I am welsh)Today's decision is inconsistent with the others in the tournament. I wonder why you have not mentoned the lack of application of this memo in other games where tip tackles have only resulted in yellow cards.You could argue in all the other tackles that players safety was disregarded,and no-one would really disagree with you. What about all the other tip tackles in the tournament that have not resulted in red cards. the two yellow cards from France vs Tonga resulted in 3 and 5 week bans. ergo, these should have been red cards. Chutney, don't be fooled. Just cos it has the header "article" doesn't mean it is any different to any other post on this site. Today's decision is inconsistent with the others in the tournament. maybe the real point is that the others were inconsitent with what the IRB have said should occur. Hardly ARs fault that others haven't read the procols and act upon them. If in the UK everybody but you drives at 100mph everywehere (including ploicemen, judges, magistrates, lawyers etc etc etc) wheras you keep to the speed limits are you wrong and they right? and AIUI the refs concerned will be hauled over the coals for it. If 10 people get away with speeding down a road, but you get caught, their luck is not a reason you should escape punishment. 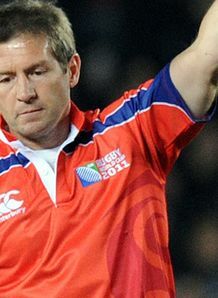 Rolland did what the iRB specified he needed to do, it was a Red Card offence, no matter how you feel. I was routing for Wales too, but as soon as I saw it I said it should be red, though expected to see a yellow, as so often is the case. You know what they say, you know it's a red straight away. I read your post afterwards, but you are rights, others not policing the game properly doesn't mean the one who does should be criticised. The issue I have is the manner of issuing the Red. It was done instinctively and immediately. That is the Fred Howard test: if you find your finger pointing to the dressing room, you know it was a sending off offence. It was scarcely a panic response. Why should he discuss it? He saw what happened very clearly for himself. That is the Fred Howard test: if you find your finger pointing to the dressing room, you know it was a sending off offence.It was scarcely a panic response. Why should he discuss it? He saw what happened very clearly for himself. OB I agree 100%. Said to my son immediately incident happened 'we'll be playing with 14 from now on'. My point is though it doesn't hurt to CYA in terms of how you flourish the red. There was all sorts going on. Television pictures didn't show the Red. I just think he could have slowed the whole process down with some clear words of explaination. Maybe he didn't need to discuss but if he called his AR in and said 'This is what I saw ..... I think it is a Red .... did you see anything that would not back that up?' Any AR would have nodded sagely, red card from pocket, less controversy. (I personally don't have any issue with the Red) The issue is we are in 'Hollywood Rugby Land' where the vast majority of the viewers including the pundits do not know or understand the laws. Rolland could have made the process easier for himself IMO. I never said it should not have been red. I think he was right to be sent off. My point was, as didds has spotted, was other refs have bottled it. Rolland will now be unfairly criticised. Robert, I therefore felt that your knee jerk reaction to post this article missed the real opportunity. The fact that the watching public are now under the false impression that Rolland was wrong, simply because of the inconsistent application by his colleagues.This whole area is too vague in allowng an official to interpret how safe a player may or may not be with his legs pointing vertically. It is ludicrous. To me the player is never safe and should be instant red irrespective. Yesterday somebody in another thread remarking ion the shables that was the Aus scrum and the breakdown generally in SA/Auis last weekend said "Rolland won;t bottle it". Give the bloke the final because he is one ref that doesn't;t bottle it and seems prepared to apply the laws (as well as any ref at the elite level does anyway). "the referee is the sole etc etc etc "
Maybe he didn't need to discuss but if he called his AR in and said 'This is what I saw ..... I think it is a Red .... did you see anything that would not back that up?' Any AR would have nodded sagely, red card from pocket, less controversy. (I personally don't have any issue with the Red) . AR following IRB guidelines is happy with what he saw. Should he then give somebody else the option of hanging themselves out to dry a la Mike Phillip's try? He is either the sole arbitrator of fact etc or he is just a bloke that coordinates several people into coming up with a consensus. what happens if one AR says "deffo red" and another says "err... just a PK" ??? Its a red card. Pure and simple. The world and his wife - maybe in justifiable ignorance due to the IRBs alleged lack of public display of the protocols - is repeating the shite that was expoused on TV. This is the ONE place of sanity - and some of you guys are hanging a fellow ref out to dry. Absolutely. If anything, it sends out a signal that dangerous tackles are (for want of a better word, or one of those Jurassic things, a Rogethaurus I think they call them) dangerous and unacceptable. Bryce may or may not have had a bad day at the office, but Alain didn't. This is a misunderstanding; if you take him past the horizontal we'll call it a dangerous throw and ping it, but we're far more lenient with what comes next; there's certainly no requirement to "start at red and work down" or anything like that. If a tackle like that had occurred in one of my games it would have been ten in the bin and a flea in his ear. I haven't misunderstood, I was offering an opinion and an alternative that might go further in erradicating this tackle (and ambiguity for us) from the game. Have you read the judicial officers reports into these other tackles? They're on the IRB website. In both cases one or more of the match officials comes in for some pretty heavy criticism for not issuing reds. They give a good idea of what the referees and other officials have to go through at the citing hearing both in justifying their original decisions and in accepting the judicial officer's decision. In fact it's more like the officials being in "the dock" than the players.